We offer ISO 13485 certification consultancy and total documentation for quality management system for the design and manufacture of medical devices. So far many companies globally have taken our services and successfully developed quality management system with our help. We have a team of highly-experienced quality management system (QMS) consultants to guide medical device manufacturing companies on system implementation, documentation and training process, and help them establish effective and good quality system and get quick certification. The ISO 13485 certification audit is done by accredited certifying body auditors. Our QMS consultants develop and produce a management system that complies with the requirements of customers and pre-eminently-of various global regulators. Our company offers Quality System for Medical Device - ISO 13485:2016 Documentation Kit, which is ready-to-use solution for quick documentation process for easy certification. We have developed readymade documentation kit for Medical Devices Certification that organizations need to demonstrate their ability to provide medical devices with quality system certification and to consistently meet customer requirements. There are requirements applicable to medical devices and related services to establish quality system. During implementation of ISO 13485, documentation including manual, procedures, policies, operating instructions and forms are prepared by the companies to establish a good working system. Our experienced Quality system consultants have designed such quality documents to help medical device manufacturing companies establish effective documentation. Sample ISO 13485 Manual (40 pages in Word document). Exhibits and Operating Procedures to follow while implementing quality system (04 Exhibits and 06 SOPs). Set of formats and templates for maintaining records (61 sample forms). Process flow chart, which guides to establish good process approach. Medical device technical files (total 21 files in Word document). Audit Checklist - to verify implemented quality management system for medical device. The entire ISO 13485 documents are well-written in English and provided in editable .doc format, so that your documents will be ready just with minimal editing. 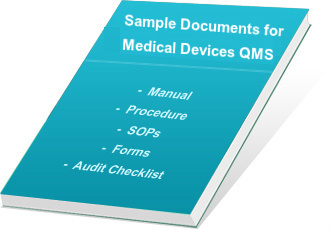 You can purchase the total documentation kit for Medical Device QMS with easy editing features and compatible with system requirements. It is a very effective tool to learn and implement QMS documentation, completely meeting the demands of the updated system requirements. Many companies are implementing ISO 13485 system as per 2016 requirements and getting benefits of certification as improved QMS for medical devices in day-to-day life. Users can easily amend and change the iso 13485 manual and templates as per their working system and create their own quality documents quickly. Saves much time and cost of document preparation. It gives 100% value for money to customer. Procedures and formats provided in the documentation kit can help in fine-tuning the processes and establishing better control over quality management system. Documents are useful in training of staff on QMS system requirements. Takes care for all the sections and sub-sections, which gives better confidence as well as improves the system. Effective tool to create ISO 13485 manual, procedures, records and audit checklists for quick certification. View free Demo of ISO 13485 Manual Documentation Kit and purchase it with secure online transaction.